The ANT Blog: Have you noticed that the full moon has recently got bigger? Have you noticed that the full moon has recently got bigger? No, it has not really got bigger at all – the Moon’s orbit has just been a bit closer than normal to our planet the past month or so and this has resulted in the moon appearing to be bigger and brighter. This interesting phenomenon is referred to as a ‘Supermoon’ and it occurs when the proximity of the Moon to the Earth accompanies the full moon phase of the Moon’s cycle. 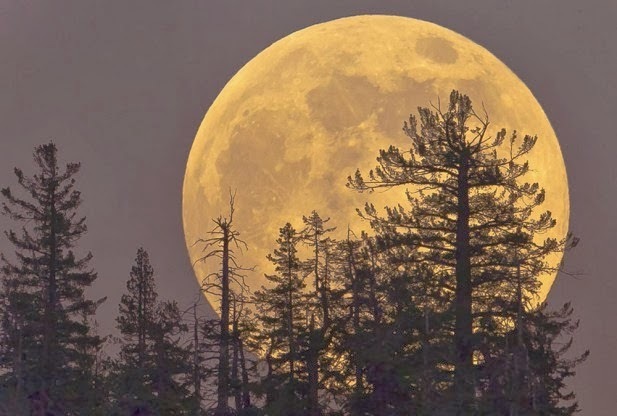 2014 will be a bit of a record with Supermoons, with three occurring in one year: the first two in July and August and the final Supermoon in September. To have three Supermoons in such close succession is rare and is not expected to happen again until 2034! It is not only during Supermoons that the moon appears larger. Have you observed that a full moon rising appears to be larger than compared to when the full moon is directly overhead? The moon doesn’t physically change size over the course of an evening , so why does our brain think it has? This phenomenon illustrates the Ebbinghaus Illusion. When the Moon rises and is visible on the horizon, the human eye compares its size to other visible objects (trees, power lines, buildings, etc) and, versus these objects, the Moon appears comparatively much larger. However, once the moon rises higher in the night sky, the human eye has no other objects against which to compare the moon’s size and it then appears comparatively smaller. 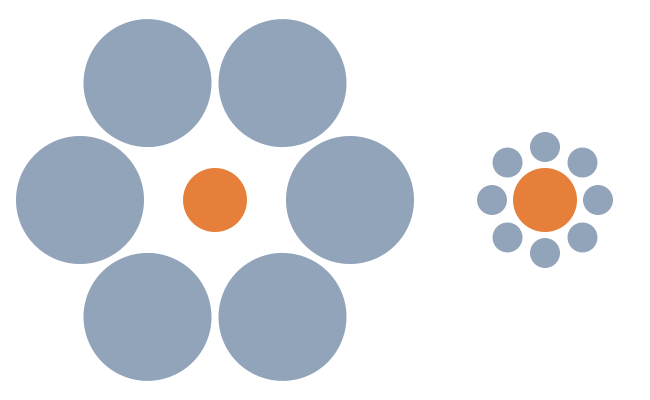 ﻿﻿ In this image, the two orange circles are exactly the same size, but we perceive them as being different, which demonstrates the Ebbinghaus Illusion. So our mind plays tricks on us, making us think that the size of the full moon changes during the course of an evening!